The National Library of Belarus is one of the most impressive buildings in Minsk. You may have never heard of Belarus. It’s one of those former USSR territories that gained its independence in the early 1990s and hasn’t seen a lot of publicity since. It’s strongly tied to Russia (Belarus actually means “White Russia” even though no one has ever heard of the created-in-America drink) and currently has the same leader (some say “dictator”) for almost 30 years. It doesn’t have a coastline, making it impossible for the country to ever become a cruise ship destination and lacks any famous landmarks you’ve heard about. Belarus has been one of the most challenging European countries to visit because of its difficulty in obtaining a visa. All of this just sounds too good to be true, doesn’t it? Don’t you want to book that flight today? Why should you go to Belarus? Travel requirements significantly changed at the beginning of 2017. Instead of having to find sponsors to vouch that you’re not a spy, or being required to pre-book some ridiculously priced tour to get that coveted visa stamp, you can now enter Belarus visa-free for up to five days. This makes it a great little stopover while you’re visiting someplace else in Europe. The rules are pretty specific, though. You have to fly in and out of Minsk from a city that’s not in Russia. You can’t come by train, car or walk across the border. When you arrive, you’ll need an address of where you’re staying and insurance which a nearby counter rep will grimly sell you for $5. That’s it. An inaccessible country suddenly became easy to get into and you should take advantage of it, particularly if you’ve been a lot of places and want a unique experience. Belarus is definitely different. 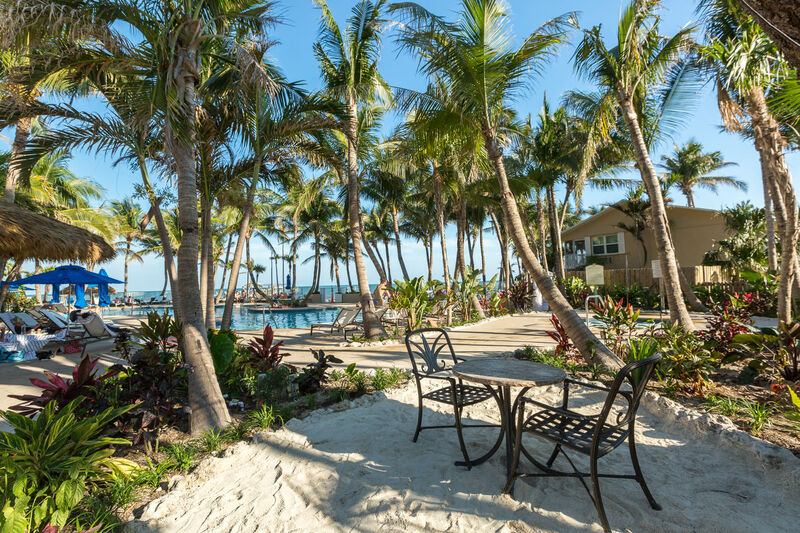 It doesn’t have to be your entire vacation. You can grab a cheap flight with Austrian Airlines (or other inexpensive carrier) from a European city such as Milan or Vienna and enjoy a 2-3 day stopover. Prices are cheap and you won’t have to fight hordes of tourists even in the summer. Minsk was pretty much wiped out during World War II and very few old buildings survived. The rest of the country has some treasures, but you’ll probably need a car to see them. The capital city is serviced by Uber (which is really inexpensive), has cheap buses and a two-line metro. Most of the sites are lined up, making it pretty easy to see the city in two days. 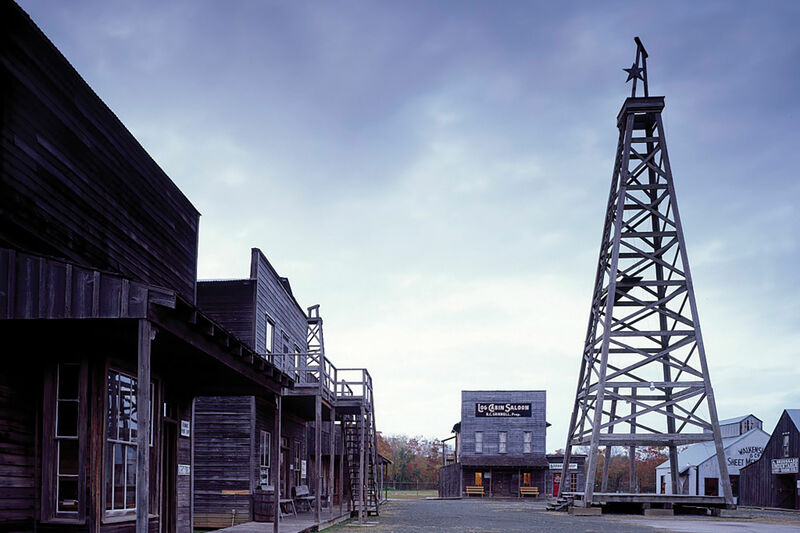 If you have more time, you can visit some of the other towns. Belarus isn’t that large and has a nice highway system with beautiful forests, lots of rest areas and traveler conveniences. You can also use their inexpensive train system. The "Stela" at the Great Patriotic War Museum. 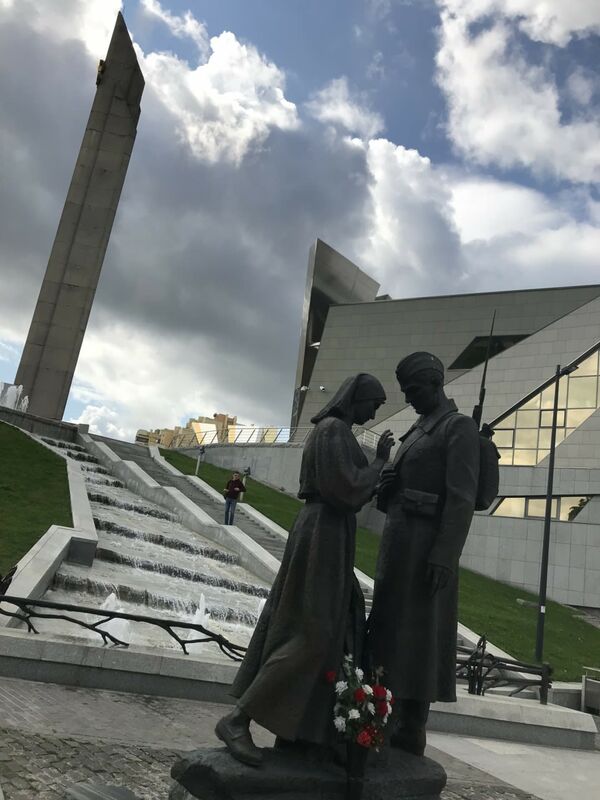 A good place to start your visit is the Great Patriotic War Museum. This unusually shaped building is the only World War II museum in the world conceived while the war was still in progress. There's a large monolithic structure called the “Stela” with a waterfall fountain, a statue of a soldier with a woman, and the museum itself. The displays are wonderfully designed with tanks, planes and weapons that have been restored so well they almost look new. Costumed life-size figures and backdrops are used so you’ll get a pretty good feel for how and where this equipment was used. The focus is on the heroes of Belarus and Russia, so there are a lot of photos, belongings and uniforms that belonged to the honored. The top floor has a dramatic domed glass ceiling and the names of thousands of the soldiers engraved on the circular wall. Belarus lost a third of its population in that war and it hasn’t been forgotten. Minsk is full of parks. Some of them are huge and no matter where you are, you’re never more than a few minutes walk from a patch of green. Belarussians love nature and the Svislach River snakes through the town and is fringed by one park after another. You can take a stroll, go fishing, jog, have a picnic, or even get married. I’ve never seen as many weddings happening at one time anywhere as I did in Minsk. I rented a Segway for $10 for half an hour, which was just how much time it took to navigate around the lake. There were very few rules, no guide required, no insurance forms, and I wasn’t forced to wear a goofy helmet. Just pay the guy and go. Simple and easy. Sure, I should have worn the goofy helmet, but I didn’t want my $5 insurance policy I’d bought at the airport to go to waste. Besides the parks, there are a lot of monuments scattered throughout dedicated to freedom and heroes of World War II. The street names reflect it as well. Victory Park, Independence Square, Fountain of Independence and lots of other names that seem to inspire patriotism. Sure, it seems a little heavy on the propaganda side, but they have had the same president for 30 years. Since World War II, there’s really not been any wars or skirmishes, so most everything patriotic is focused circa 1945. The Holy Spirit Cathedral is one of the few impressive churches in Minsk and is walking distance from the city center. 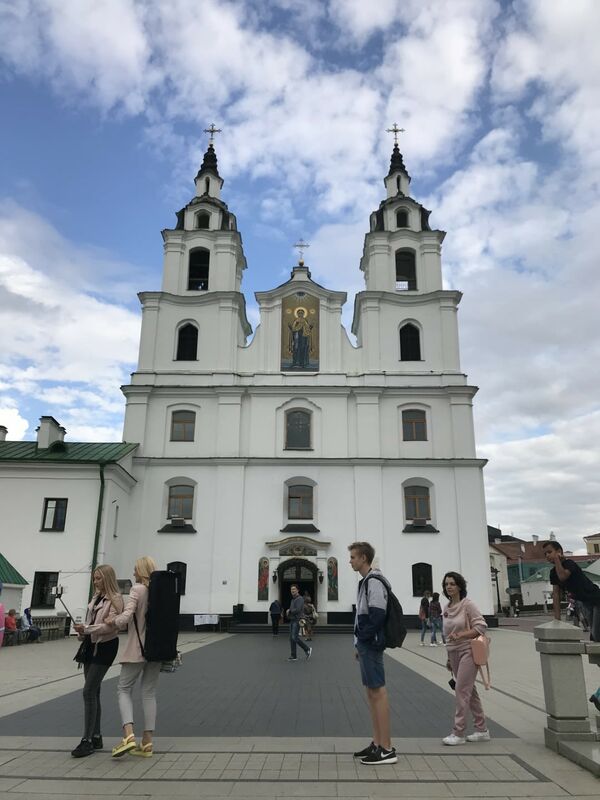 The Upper City contains most of the oldest buildings of Minsk and has a lively festival on the weekends with music, local food, places for kids to play, handicrafts, and of course lots of drinks. It’s hard to find cheaper drinks in Europe than you will in Minsk. You can order flavor-infused vodka shots at a restaurant or great local beer for about a dollar. You can even raid the mini-bar at your hotel without feeling guilty afterwards as long as you stick with the local products. A bottle of Belarussian vodka is cheaper than a bottle of imported water. The food has a lot of Russian influence and the menus often feature colorful photo offerings of salads, stews, cabbage, beets, a variety of meats and potatoes. Even the Irish can’t compete with the number of dishes that have potatoes in them. The Belarusians love potatoes! A lot! Most former Russian countries aren’t very religious, but there are a few impressive churches to visit in Minsk. The two most famous are The Holy Spirit Cathedral and The Church of Saints Simon and Helena. 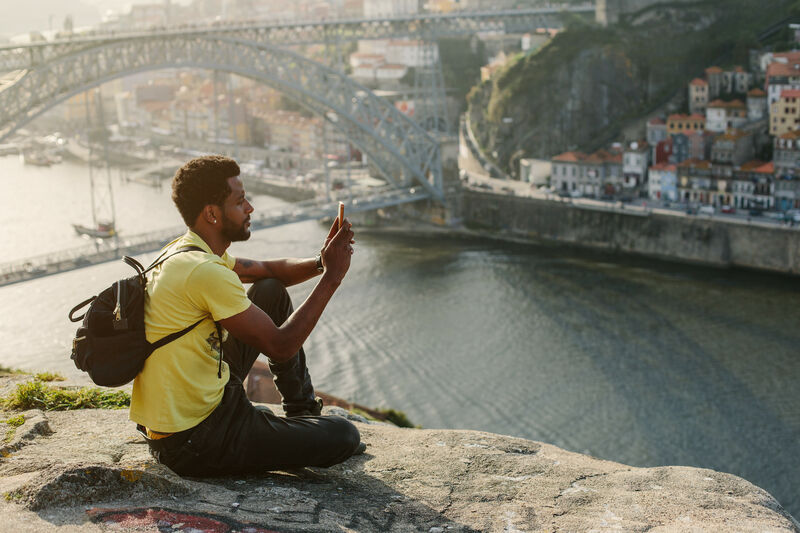 Both are walking distance from the city center, but if you want an adventure, navigate your way there with the two-line metro or you can Uber just about anywhere for less than $2. 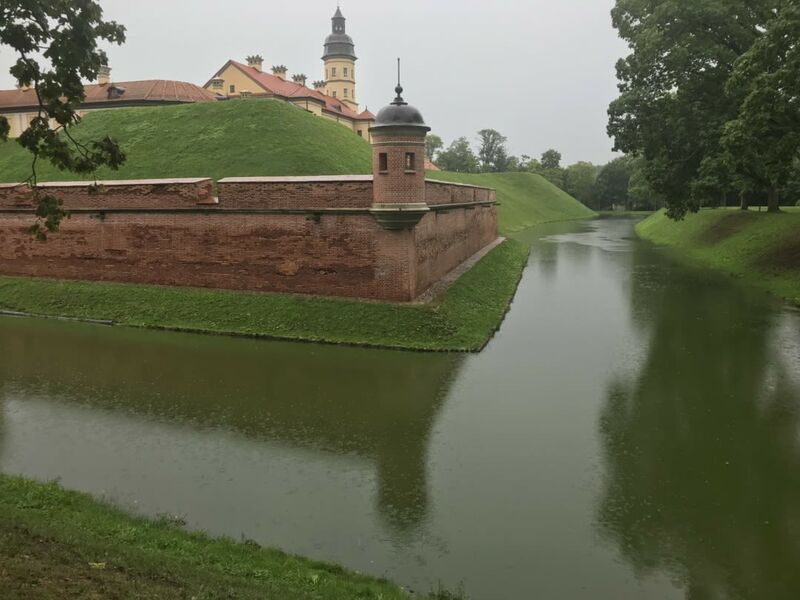 The castles of Mir and Nesvizh survived the war fairly unscathed and give travelers a good glimpse into Pre-soviet Belarusian history. You can arrange a nice day trip with your hotel—or if you’re feeling brave, rent a car and do it yourself. You can visit the castles of Mir and Nesvizh. Both properties and their surrounding grounds survived the war fairly unscathed and give travelers a good glimpse into Pre-soviet Belarusian history. They are both UNESCO world heritage sites. The drive takes you through pristine forests and picturesque villages and is a nice change from Minsk. Further southwest, the Brest region offers some great buildings to visit as well. 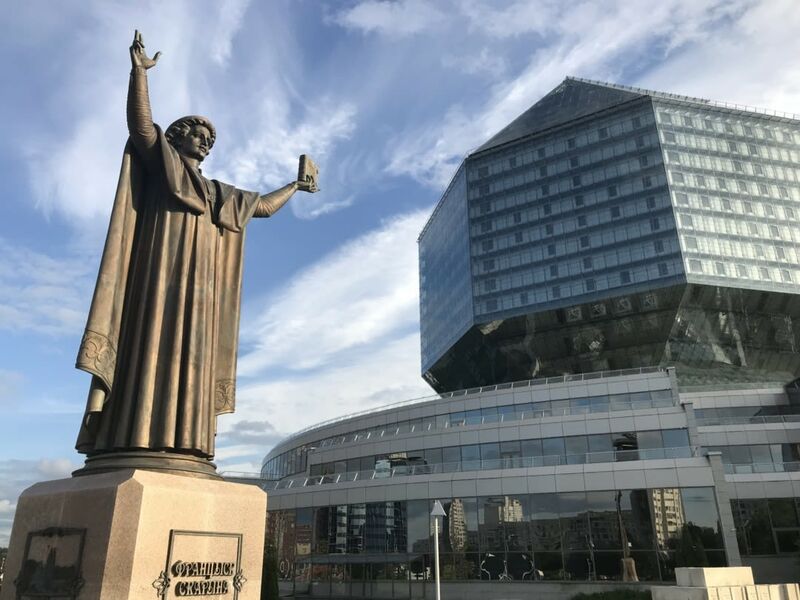 If you would like to see the mini-versions of the most famous buildings in Belarus, the Museum Strana Mini gives you an overview of the important buildings in Minsk, the palaces in the rest of the country and is a good place to stop when you first arrive to get a feel of what interests you. This museum inspired me to rent a car and drive to Mir and Nesvizh and completely change my plans I had of just lounging around for the day. This National Library of Belarus is one of the largest libraries in Europe. 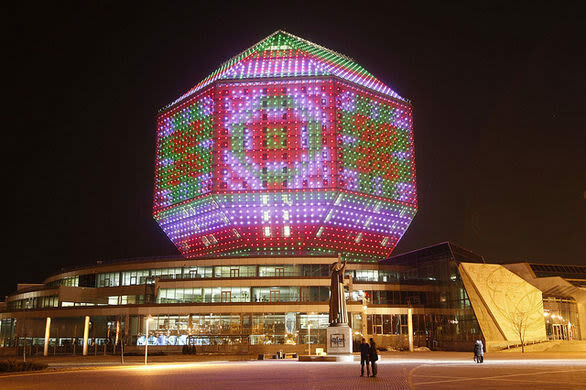 One of the most impressive buildings in Minsk is the National Library of Belarus. This building is a unique rhombicuboctahedron shape (say that 3 times!) and is one of the largest libraries in Europe. It houses 8 million items of various media and is visited by over 2,000 people a day. It’s features Minsk’s only observation deck, and allows for shows in front of its massive front area. In the evening, the building lights up with LED videos projected with various themes on its sides. You can get by in Belarus with English, but it’s not spoken by the majority of the population including taxi drivers. 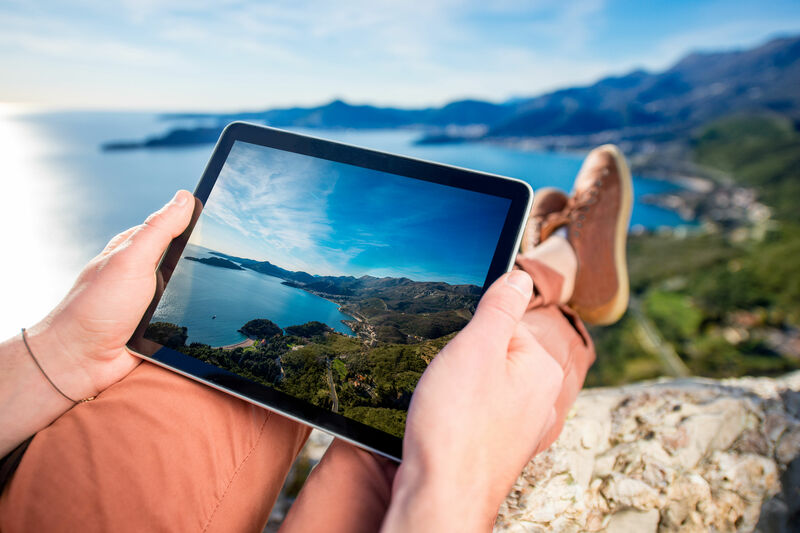 However, many of the younger people can probably help you as well as those who work in hotels, travel agencies or other tourist-related businesses. It’s very helpful to learn the Cyrillic alphabet before you leave. There are a lot of phone apps available for this and learning the letters is not as difficult as one might think. Once you know how to pronounce the letters, you’ll be surprised how many Russian words are the same as words you already know: hotel, taxi, parking, restaurant, and the names of cities will be readable if you’re driving. I learned my letters in a few hours and was sounding out words like a first grader my whole trip. You can even print the letters on a card and carry it around with you. You’ll rarely see any signs printed in the Roman alphabet (the one we use).